So your kids have been crying and pulling your clothes begging for you to get them a telescope. The question is, can you trust your children to handle such a delicate, intricate piece of equipment? Maybe they want to be astronauts or astronomers one day, and there is a telescope perfect to suit their unquenchable thirst to explore. The Vixen Space Eye is an excellent family-friendly telescope that has brought people of all ages together through its power to make the distant stars light up in its lenses. Let’s explore how the Space Eye has earned its reputation. One of the reasons behind the Vixen’s family-friendly nature is its weight. 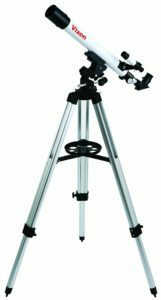 At a comfortable scale of 6 pounds (minus the tripod), the Space Eye is the lightest telescope on the market. This makes it easier for younger children to carry it around without close adult supervision. Nevertheless, you’ll want to be careful considering the telescope and its optics are still pricey. Be careful, however—just because the telescope is light doesn’t mean it isn’t easy to tip over by accident if bumped or hit. The Space Eye is constructed with a single 50mm eyepiece which makes it suitable for entry point magnification. It also comes equipped with a slow motion 5×20 finder scope for an easier time tracking objects as they move across the sky. People with telescopes that are not equipped with finder scopes might experience their object “skipping” as they view it. This is a refracting telescope, which according to our guide, means that it makes use of a primary lens as its objective. The maximum magnification of the Space Eye is 100x the original. This gives it a noticeable punch to its viewing power but not on the level of the Astromaster, the next step up. The Space Eye can come equipped with a 51x magnification and additional 70mm, 20mm, and 4mmm eyepieces depending on the customer. You are likely to pay extra for these modifications. To be able to look up into the night sky in the first place requires a particular type of mount. The Space Eye makes use of an altazimuth (alt-azimuth) mount that allows it to objects on the vertical and horizontal axis. Prices vary on the Space Eye, but one thing you can count on with this telescope is reliability. It doesn’t have the most powerful optics in the world, but it will give you a good first impression of the stars. For its unbeatable low price, the Space Eye is fun for not just one user, but the entire family.